Edward of Westminster (13 October 1453 \endash 4 May 1471), also known as Edward of Lancaster, was the only son of King Henry VI of England and Margaret of Anjou . He was killed at the Battle of Tewkesbury , making him the only heir apparent to the English throne ever to die in battle. Edward was born at the Palace of Westminster , London , the only son of King Henry VI of England and his wife, Margaret of Anjou. At the time, there was strife between Henry's supporters, and Richard Plantagenet, 3rd Duke of York , who had a claim to the throne and challenged the authority of Henry's officers of state. Henry was suffering from mental illness, and there were widespread rumors that the prince was the result of an affair between his mother and one of her loyal supporters. Edmund Beaufort, 1st Duke of Somerset and James Butler 5th_Earl_of_Ormonde, Earl of Wiltshire , were both suspected of fathering Prince Edward, however, there is no firm evidence to support the rumors, and Henry VI_of_England himself never doubted the boy's legitimacy and publicly acknowledged paternity. 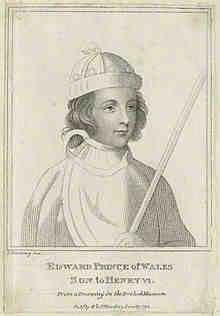 Edward was invested as Prince of Wales at Windsor Castle in 1454.